After a 7 year hiatus, Jan Jelinek finally returns to arguably his most interesting project: Farben. Over the course of 30 of the most sumptuous and layered minutes imaginable, Jelinek draws deep on a mix of unreleased archival material and new constructions to re-define his position as one of the most interesting producers in electronic music. 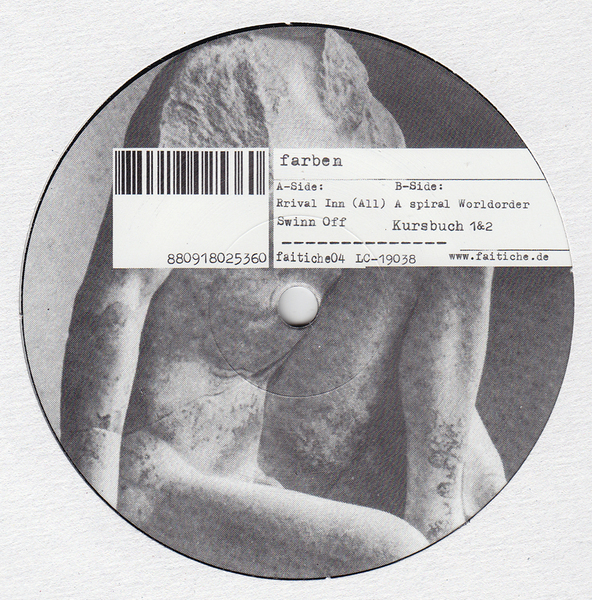 Between 1998 and 2004 he released a succession of Farben releases for Klang Elektronik that more or less defined "microhouse" with a magnified attention to detailed sound aesthetics and elegant, streamlined rhythm constructions. The four long tracks featured here are very much in that vein, yet seem to draw on Jelinek's more recent fascination with Radiophonic techniques and early electronic music. 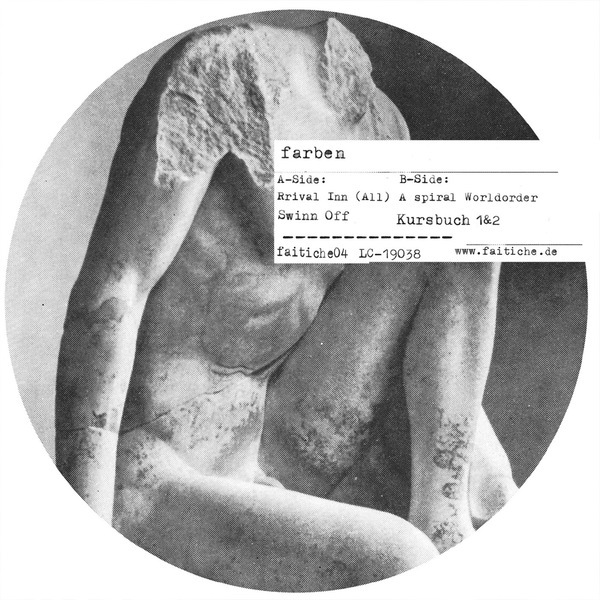 Opening track "Rrival Inn (All)" in particular merges discordant instrumentation and techniques borrowed from Musique concrète for a retro-futuristic variant of Techno, somewhere between the Moritz Van Oswald Trio, Bernard Parmegiani and Karl Berger. 'Swinn Off' returns to the kind of supple House production which earned Jelinek so much attention over a decade ago, all breathy, indistinct textures and geometric shapes curled into a sumptuous groove. On the flip, 'Aspiral Worlorder' is an effervescent collage of pizzicato strings, flute and crackling sonic ephemera dispersed like a rare gas over spherical House patterns, but for the closing "Kursbuch 1&2" Jelinek manages to string an opening that borrows from Martin Denny's Exotica and Disco all at once, before slipping into a robust and pounding square bass session that just completely seals the deal in a glorious, unexpected fashion.